I read with great delight Brent Beltrán’s article on “El Día de los Muertos” festivities in San Diego. It was quite appropriate not only because the timing was perfect but also because San Diego Free Press (SDFP) had just published an article commemorating Aztleca’s memory and ceremonial farewell held at Chicano Park on Saturday, October 27, 2012. And, SDFP asked me to do a follow up. This was a perfect lead to do the follow-up and respond to Beltrán’s within one piece. With El Día de los Muertos just around the corner from the celebration of life for Aztleca, one can could surmise that indeed it was a well-deserved farewell as much as it was a “thank you to” and a “welcome for” Aztleca. Diligently, he danzó over 40 years every Día de los Muertos at Chicano Park, honoring those who passed on. And on October 27 of this year, it was others who dansarón (danced) for him for the first time since the 1970’s when the first Toltecas en Aztlán started las danzas indígenas de nuestros antepasados precolombinos (the indigenous dances of our pre-colombian forefathers). Having covered the event and eye-witnessing so much spiritualism, I ventured to take the photos presented here. Although Aztleca’s altar was not one made for El Día de los Muertos, it resembles altars made for that purpose. I ask for the readers’ indulgence as well as that of Aztleca’s for me daring to equate altars. 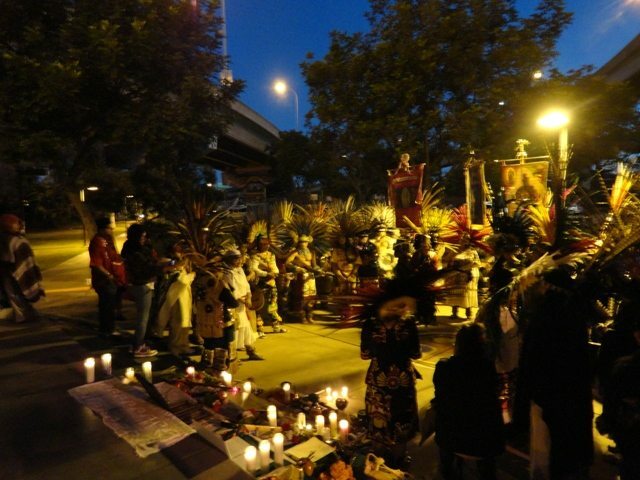 Although similar and symbolic of honoring lives, Aztleca’s altar was a send-off to higher levels, whereas the altars of El Día de los Muertos are to pave the path to make it possible in re-uniting (in Spirit) our Past, Present and Future Relations here on earth per the beliefs of some people. It is with the intent to clarify how and why some of us, people of Mexican descent, celebrate El Día de los Muertos that I respond to Beltrán’s inspiring article. Beltrán opened a path for me to chime in and I do appreciate it. Traditions are basically regional and true to the culture of the geographic area. As such one of the original traditions celebrating the Day of the Dead/El Día de los Muertos is that we, who celebrate those days, believe that heaven opens its gates at midnight on October 31st and that the spirits of the “inocente angelitos” (innocent children who passed on) re-unite with their families on earth come November 1st. Similarly, the spirits of the adults who passed on re-unite with their families come November 2. So, how exactly do these spirits of loved ones know where to go for the reunion? It all has to do with the setting of the altars created for their honor. Setting up ofrendas (altars) takes a lot of time, a lot of money, and a lot of love. 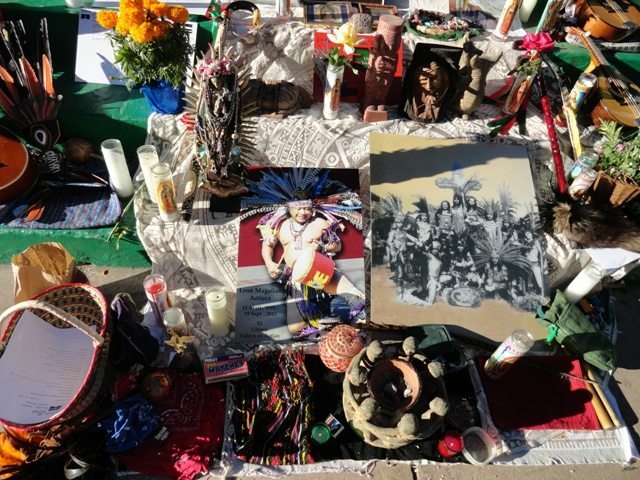 Ofrendas (offerings) can include pictures of the celebrated relative, surrounded by things that s/he held dear to him/herself as well as their favorite foods, beverages, toys, gadgets, etc. Popular among which are chicken mole (spicy Mexican gravy-like sauce made with chocolate, peanuts and other condiments, stewed along with chicken), Mexican chocolate, as well as Pan de Muerto (dead man’s bread), and always water. The idea is that these “beings/spirits/souls” traveled from far away and need the food and water to regain their strength. They also need their favorite things to rejoice in the memories. And the love imparted by those who made their altars is food for their souls. The return is just as great! It’s believed that, in turn, the happy spirits will provide those of us on earth their protection, well wishes and wisdom. So what goes on the altar besides food and favorite things and again how do the souls find their way to us? The offerings are considered, to be “más allá de la muerte” (beyond death). They contain offerings which consists of calavera alfeñiques (colorfully decorated skulls made out of sugar), a cross made of ashes, copal (aromatic tree resin) burned with natural charcoal, pan de muerto [sín levadura] (bread without any yeast), sál de grano (unrefined salt chunks), water, cempasúchil (marigold flowers) and three white candles. The cempasúchil helps to open the pathway. The sál de grano purifies their path. The water purifies the soul. And the three white candles placed in the shape of a triangle light up the path. Not only are the altars made in individual homes and gardens but in México, it is quite a sight to see! The cemeteries are like a huge party setting with various altars made on the tombs or around the tombs of those who were laid to rest there. The bright light from the hundreds of candles seem to shoot to the heavens. I would recommend to checkout and be on the watch for Mexican television coverage. It is quite amazing. And it all starts October 31, culminating on November 1st and 2nd. Articles like this are why I am committed to citizen journalism. We not only get a broader view of our city and county, but a more in-depth view from engaged and articulate perspectives. Thanks Remy & Brent. Hi Anna, Thanks for letting me know that there have been over 200 hits on this article. It is moving to know that our tradition is alive and well not just here but all over the world. The Mexican News , this morning stated that this tradition started in the 10th century B.C. or A.D. was not specified. The Mexican news today had coverage of El Dia de los Muertos festivities around the world. It noted that anywhere where there are Mexicans the fiesta for our dead is celebrated. And that not only do we get to celebrate and chat with our Past Relations, but we celebrate with the live ones as well. It had footage from Spain, Rome, Peru, Guatemala, England, Germany, France and many other countries. It also stated hat this tradition started in 10th century. El Dia de los Muertos, our tradition, lives. THANK YOU, SDFP! for your broad coverage on so many diverse topics and themes! It makes me feel all warm and fuzzy inside to know that I inspired you to write this piece. Thank you, Remy. The icing on the cake was your article, http://sandiegofreepress.org/2012/10/desde-la-logan-dia-de-los-muertos-we-commemorate-our-dead-2/, briefly sharing how you and your family celebrate El Dia de los Muertos and extensively identifying the various places that San Diegans can go to experience our tradition. THANK YOU, Brent, again for keeping it alive! BTW should anyone be interested on receiving other photos of the celebration for Aztleca at Chicano Park write to me directly or post your comments here.